An architectural gem atop a natural wonder, Timberline Lodge is an acclaimed ski lodge and mountain retreat on the south slope of Mt. Hood, standing 6,000 feet above sea level. Boasting a rustic elegance, Timberline Lodge is a beautiful mountain-top resort affording exceptional service and enchanting accommodations. 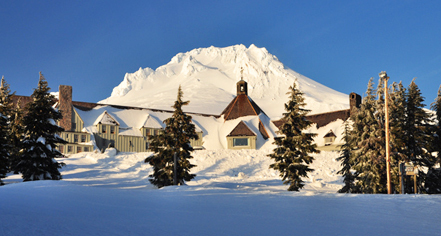 Hand-built in 1938, using regional materials and resources, including local stone and timber, Timberline Lodge was declared a National Historic Landmark in 1977. Embracing and celebrating the regional themes: wildlife, Native American, and pioneer, the lodge's original structure, architectural details, and decorations remain unyielding, attesting to its authenticity of the Pacific Northwest style. Inviting a gracious warmth, Timberline Lodge is a historic luxury hotel featuring comfortable guestrooms and suites, refined and sustainable dining, a world-class ski and snowboarding facility, thoughtfully-appointed event spaces, and, most of all, distinguished hospitality. Surrounded by lush forest with stunning views of the Cascade Mountain Range, Timberline Lodge is a truly unique destination for recreational travel and leisure. 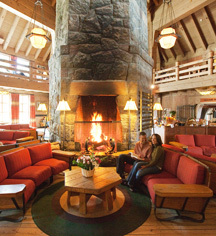 Timberline Lodge, a charter member of Historic Hotels of America since 1989, dates back to 1937. In 1937, the Lodge was dedicated by President Franklin D. Roosevelt as a “monument to the skill and faithful performance of workers on the rolls of the Works Progress Administration. Accessible Rooms: Two (2) accessible rooms are available. Please notify request at time of booking. Adjoining Rooms: Six (6) adjoining rooms are available. Please notify request at time of booking. Cancellation Policy: 7 days prior to arrival. Deposit: One nights advance deposit required at the time of booking. Extra Person Fees: Extra person fees apply. Hotel/Resort Fees & Taxes: All reservations are subject to a City/State Tax of 7%. Occupancy Restrictions: Rooms sleep 2- 10 people based on the style of room. Pet Policy: Service animals allowed: Yes. Pets allowed: Yes. Amenities: Dog Bed, Water Bowl, Treats, Doggie Waste Removal Bags. Restrictions: Dog Friendly. Maximum weight: None. Maximum amount: 2 dogs per room. Fees: $50.00 plus tax per dog. Other: 12 rooms available. Dog Ambassador: Bruno. Rollaways: Available upon request; extra person fee. Learn more about the History of Timberline Lodge .